Mets beat Phils, Red Sox won, Yanks lost (to the O's, no less). And, this morning, I find that the Mets have accomplished one of my goals for them: with their fourth straight win, while the Bronx Bullies flounder, they've supplanted the Yanks on page one of the Times sports section. Your team moves to another city. You grew up in a city that didn't field a team for a specific sport - so you picked a random team - and then either a.) your city landed a team, or b.) you moved to a city that fielded a team for that specific sport. (There are other exceptions that are irrelevant here. One of them is if the owner of your team has proved to be irredeemably loathsome. Of Fred Wilpon, I can only turn an oft-used New York-ism on its head: what's there to loathe?) As I've explained before, I first chose the Brooklyn Dodgers. When they went to L.A., they lost my loyalty (in accordance with Simmons's first exception), but it did not shift to another team. Instead, I simply lost interest in baseball. When I moved to Tampa, which then had no team (it was then, in pre-Steinbrenner days, the spring training camp for Cincinnati, so there was some local loyalty to the Reds) I didn't choose a random team, I just remained indifferent. Then I moved to New York and, in accordance with Simmons's rule, I picked the Mets as the logical successors to the Dodgers. But the Mets aren't moving (except into a new stadium next year), so I don't get the benefit of that Simmons exception, even though my old home town now has a team (which it didn't at the time I picked the Mets). Besides, my antipathy to the designated hitter rule makes it difficult for me to have any American League team as my primary loyalty. Finally, being a Rays fan would bring me into direct conflict with my wife's Red Sox fealty. So, I'll continue to suffer with the Mets and root for the Rays only when they play the Yanks. Best description so far of the presidential campaign. You were all excited about this election and now you feel like someone who got all dressed up for a great event and wound up at a B-list party with a cash bar. Obama manages to be much more gracious, but really, this is like watching two people competing for the job of Head of Brain Surgery by being required to perform an interpretive dance while the other shoots spitballs at them. Well, sheesh, I guess I can give up any notions I ever had of running for office (now about as realistic, anyway, as trying to become a rock star). What's really rich, though, is Dowd's claim that San Francisco is "elitism's epicenter." Any fool who's read Frank McCourt's Tis knows it's Brooklyn Heights. 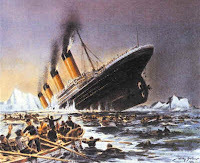 Titanic--nature's triumph or human failure? The sinking of the Titanic has always been presented as a morality tale, one in which human hubris ("unsinkable") was humbled by the power of nature. However, according to William J. Broad's story in today's New York Times, two scientists who have examined both physical evidence from the ship's wreckage and the archives of her builder, the famous Harland & Wolff, of Belfast, have concluded that nature may not have had to win the contest, or at least not with as catastrophic consequences. According to the researchers, rivets recovered from the wreck show an unusual amount of slag mixed with the iron from which they were forged. Moreover, minutes of H&W's Board of Directors meetings at the time Titanic was under construction document discussion of the difficulties in procuring sufficient rivets, which may have led H&W to rely on substandard suppliers, as well as problems in finding skilled riveters to hire, which could have led to faulty workmanship. Present and past officials of H&W have disputed these conclusions, one of them calling them "a waffle." Also, James Alexander Carlisle, grandson of an H&W riveter who worked on Titanic, has vigorously disputed the faulty rivet theory on the website of the Belfast Titanic Society. If the researchers' theory is correct, Titanic is not so much a morality tale about technological hubris, but one about loyalty to an institution (H&W, at the time, was trying to complete on schedule what had to be the largest shipbuilding project in history: the construction of Titanic and her sisters Britannic and Olympic) trumping considerations of prudence and due regard for human life. Sometimes, bad news seems to hide from me, taking its sweet time to reveal itself. So it was with the death, in January, of John Stewart. I finally got the news yesterday morning, paging through the New York Times "Week in Review" section, and seeing a teaser for an on-line only op-ed piece by Roseanne Cash. I first knew of Stewart as the replacement for Dave Guard in the Kingston Trio (more about them in a soon to come--I promise!--post). Guard was an intelligent musician with an adventurous spirit that led to his break with the Trio when he thought their act was getting too formulaic, but Stewart brought a warmth and passion, as well as his own kind of intelligence, to the group. His voice was also an improvement over Guard's. I was a huge Trio fan through my high school and college years, and two of my favorite albums of theirs, #16 and Sunny Side, are from the Stewart period. He left the Trio in the late 1960s to go solo, working as both a songwriter and performer. Perhaps his best known song, "Daydream Believer", was recorded by the Monkees, in my opinion one of the most underrated bands, and TV shows, of the '60s, and released in 1968. The following year, his album California Bloodlines, consisting entirely of his songs, was released. I fell in love with that album when I first heard it, in the summer of 1970, while visiting a friend in Greenwich Village. Along with contemporaneous work by Gram Parsons, Stewart, in this album, helped to lay the foundation for what has come to be called "alt/country" or "Americana" music, and today is exemplified by bands like Wilco and Son Volt, and singers like Steve Earle, Emmylou Harris, Tom Russell and Lucinda Williams. So long, John, and thanks for so much. Update: There's a splendid memorial site for John, with some YouTube clips, here.